I had to chance to see D.C. Comic’s long awaited sequel to Batman vs. Superman earlier this week – in an empty theater; this is one of the great perks to waiting for a film to run its one week frenzy in the theaters. There are a few thoughts that I think should be noted about the film and the genre in general, especially in the consideration of heroes in our current entertainment sphere. However, I’d first make some comments on style and craft of the film. I need to issue a disclaimer: I’m not a consumer of comic books. I’ve never been able to interest myself in them and I’ve been completely lost every time someone says “that’s not how it went in the comics!” during an Avengers movie. That being said, it seems to me that it’s necessary to introduce the back-stories of a comic book film, especially in explaining its universe, for the film to make any sense or have any impact. Justice League did not do this – it starts out sensibly and well-paced enough, but when the villain (who was so forgettable that I can’t at this moment remember his name) is introduced about a fourth of the way into the film, the only explanation of what he wants and why he’s out to destroy the world is given in rapid two minute clarification by Wonder Woman that leaves out a horde of important details (like, for example, what in the world are the “Mother cubes” and why do they have power – where does the power come from? Who is the “Mother”?). Another example comes with the introduction of Aquaman of “The Atlantians.” We get no back-story on who The Atlantians are. If I was a comic book aficionado then I probably wouldn’t need back explanation, but as a general consumer of entertainment, the lack of character and story development leaves the film feeling rushed and formulaic to a degree that detracts from the plot in a disastrous way. Another issue related to the overall story of the film – Justice League is Avengers 2 with less humor. The parallels are uncanny, even to the point that the climax takes place in an Eastern European wasteland. Every (or almost every) character has their equivalent in the Avengers Universe. Batman=Ironman (a self-made superhero through unending riches). The Flash=Spiderman (an excitable teen made “super” by accident). Captain America=Wonder Woman (the one who puts principle over all else and wears a dark American flag as clothing). Superman=Thor (an alien who believes in truth and justice). Cyberman=a cross between Jarvis and the Hulk (because he can’t control his powers). The similarities make one feel as if they are eating a McDonald’s Burger – you would get essentially the same thing if you went to Burger King, the only difference being where your ingredients came from.“Something must be done about the dialogue in these superhero movies!” My compatriot in viewing Justice League uttered a similar sentiment after exiting the theater. 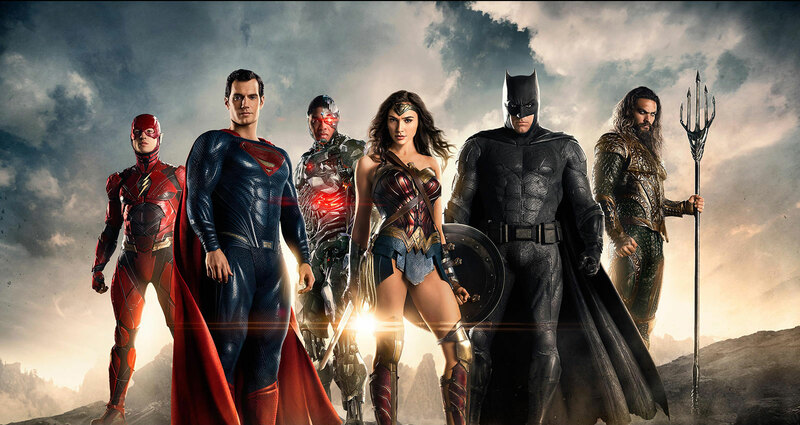 Superhero films are beginning to feel like actually playing a video game – the CGI is one reason for this (there are few wide angle shots in Justice League; in one scene Batman pops up out of nowhere – as if he steps up a stair into the camera view), the other is the cheapness of dialogue. As if there are no deep issues of discussion, almost all the dialogue is either played for laughs (this is the minority) or to communicate ideas of persistence (“Let’s go!”; “Keep going!”; “We must fight!”; “We can’t give up!”). While persistence is an admirable quality, is there nothing else to talk about? What about the fact that a demon from another universe (I think?) is using arm-sized cubes to bring a destructive force that can create entire worlds is in the same zip-code? Do none of these circumstances cause people to ask the “big questions?” The best example of this is when Superman comes back to life (oh… the spoiler warning was supposed to come before that statement wasn’t it...). When his long-lost love, Lois Lane, asks him her first question, it’s: “What was it like to come back?” What about the question: “WHAT HAPPENDED WHEN YOU DIED!!? ?” Apparently she, or the audience, isn’t interested in the number one question all of humanity is most concerned with answering (even Gandolf and Pippin in The Return of the King entertain this question when faced with death). I will not belabor the point. The film was a disappointment, as I believe most superhero films are, except for the few instances of comedy and the humor inherent in poorly crafted plot. This is not to say that some of the characters aren’t engaging and interesting in their own right (though I wonder about how many male viewers would go simply to see Wonder Woman, whose mere presence is inarguably the most distracting element of the film). I can imagine any one of the characters would make an interesting film by themselves– but this is the problem. Batman has already seen his run – Christopher Nolan (in my humble opinion) has already crafted the three best superhero movies in the D.C. Universe in the Dark Knight films – what made them great? Depth. They raised deep and interesting questions – and were (somewhat) grounded in reality, so we could identify with them more. The entire genre raises a critical question. Where should we get our heroes from? If we turn the clock back 60 years, the tail end of Hollywood’s “Golden Age,” we’ll find that the majority of popular films (not B-movies) were historical interpretations, historical fiction, or films in a contemporary setting that was grounded in reality. Westerns and war movies. The Searchers. How the West was Won. The Great Escape. Rear Window. Films grounded in reality. They pointed to characters worth emulating juxtaposed to enemies worth opposing, and we understood why they were worth opposing, beyond merely being frightening (which I would note, the “insect” like villains of Justice League were not). This is not to say that there were not films of fantasy and science-fiction –Star Trek, The Blob and The Twilight Zone. The main difference is that you could actually get the general public out to a movie theater to see a historical film about the life of Davey Crockett – and it was popular. Today films based in reality – on true life heroes, are reserved for super-specific audiences or for the Oscars, in which they need to line up and forward a leftist confessional statement that defines what a true hero is. justice? We need more real heroes from real places. Who is going to make the film about the Siege of Malta in 1565 by the Ottoman Turks, one of the most epic battles in history? The adventure film about Jedediah Smith, the illustrious explorer of the early American West. The biography of Salva Dut, the Sudanese refugee who walked thousands of miles to freedom in East Africa. Someone please make these films. We desperately need them. We need fewer Superhero movies.